In 1987, Robert Schechter and his family searched for a location where Dr. Patricia Schechter could start her Family Medical Practice. They selected Atascadero. Three years previously “Dr. Bob” retired at the age of 45 from his large practice near L.A. to become Mr. Mom, while “Dr. Pat” attended medical school. 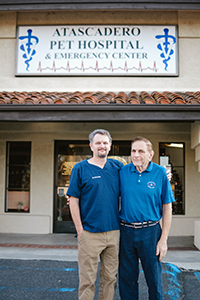 In 1989, after living in Atascadero for 2 years, Dr. Bob started a veterinary wellness practice in an old dairy barn on Rocky Canyon Rd. In 1995, the Schechter’s purchased a 5000 square foot restaurant building to allow the veterinary practice to grow. 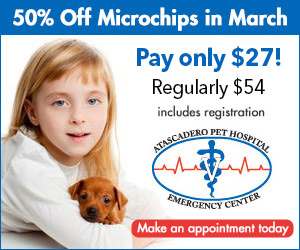 In 2002, the Atascadero Pet Hospital became a 24 hour emergency center and is open 365 days a year. 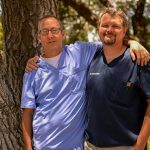 Many other veterinarians have joined the group since its startup and in 2007, Dr. Aaron Schechter and Dr. Ofer Cherbinsky became the new practice owners. The hospital now employs 9 veterinarians, 8 licensed technicians and over 30 other employees. Atascadero Pet Hospital is an amazing establishment that has grown beyond the imagination of its founders. This Veterinary Hospital brings state of the art medicine with a highly trained staff to San Luis Obispo County. The hospital has evolved to be a highly respected facility by the veterinary community. This Hospital can perform sophisticated treatments, advanced imaging (radiology), plus intricate surgical procedures for its clients. There is a doctor always present on the premises 24 hours a day.